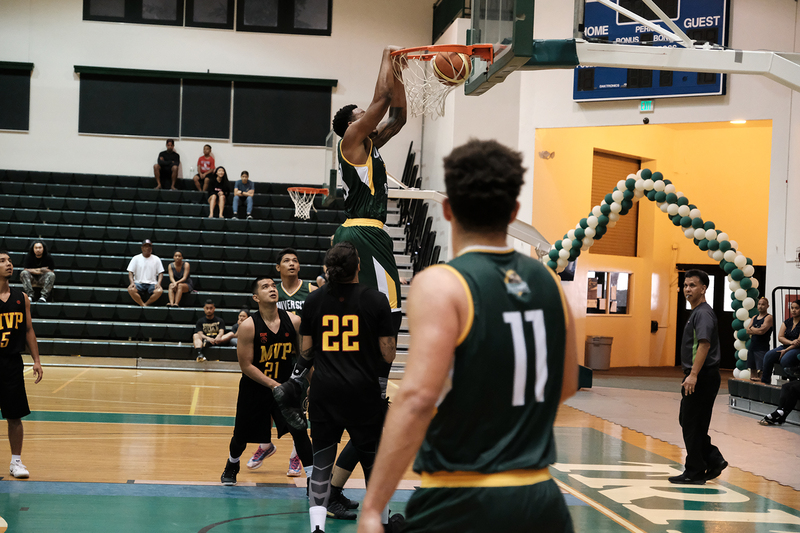 The University of Guam Men’s Basketball Team routed the MVP Stars on Saturday afternoon in the UOG Calvo Field House 119-92 to capture the #1 Seed in the Triton Men’s Basketball League Championship Tournament to start December 7th. The Tritons came out strong and went up 32-18 after the first quarter and kept the pressure on, outscoring the MVPs 24-16 in the 2nd quarter to led 56-34 at half-time. The MVPs only had 5 players on the afternoon and UOG wore the Stars down with their depth. The Tritons continued the pressure and pushed the lead up to 34 points in the 3rd quarter and led 90-57 at the end of the period. UOG cleared the bench with 6 minutes to go in the game and the final score ended at 119-92. Blake Jenkins scored 25 points for the Tritons despite injuring his knee in the 3rd quarter, but he was able to return to the line-up shortly afterwards. Demadjeo Simon scored 21 for UOG as well with Geno Anderson hitting for 18 and Anthony Brown 15. JP Cruz led all scorers with 37 points and Daren Hechacova added 33 for the MVP Stars. In the other game of the day, the MacTech Nerds defeated UOG Trident Men’s Club Team 117-101. The Trident Men’s Club Team scored 100 points for the first time in their history in the loss. Devin Sudo scored 32 points for the Tridents while Elias David added 28. While UOG Men’s Basketball Assistant Coach, Stepen Yates, scored 28 points for MacTech. UOG is now 8-0 in the league with 2 more regular season games remaining. The Tritons play next Sunday, December 3 at 2:00pm against MacTech. The Tridents fall to 0-8 and will be the #6 team in the TMBL Tournament. The MVPs are 5-3 and MacTech improved to 3-5.